Northampton is the heart of England’s most famous and prestigious shoe making heritage, and we are enormously proud to have been manufacturing our footwear in the heart of the town for more than twenty five years. Our workshop is situated in the heart Northampton town. We manufacture both cemented and Goodyear welted footwear. Cemented is generally used for ladies footwear as it’s lighter and more flexible in construction. Goodyear welted is traditional to Northampton and gentlemen’s footwear and offers a product that is easily repaired over many years. Whether you require footwear simply for style and aesthetics or your needs are medical and comfort based, there is no limit to the time we dedicate to each client and their footwear. We offer gait analysis for those who require orthoses and all types of insoles for both medical and comfort based requirements. Time-honoured shoe making skills are declining within our industry. The traditional footwear manufacturing climate in Britain is so volatile and so few factories and workshops remaining that when the Craftsman retire, their skills gained through generations of shoemakers are lost, forever, apprentices have not been trained to take their place. Along with our fellow remaining shoemakers we have become a niche manufacturing breed, making footwear that has no place in the fast paced world that holds no store with a product that is not dictated by how long it took to make and could there have been a cheaper, quicker, inferior replica. We take all the time that is needed to make footwear. 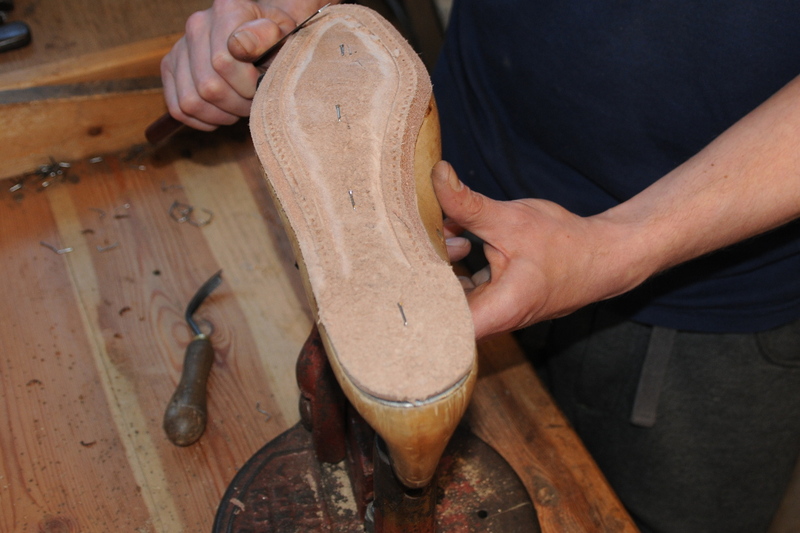 The insoles are molded to the last and then groove the insole to hold the welt. We use the finest leathers from tanneries in the UK as well as Italy and France. The uppers are left on the lasts for weeks to mould to the clients bespoke lasts. All of our manufacturing processes take place in our workshops (we do not import any element of the final product, apart from the raw leather. For the greater good of our trade we continue to offer our workshops and specialist training to the footwear students from Northamptonshire and geographically from as far afield as Japan and America.